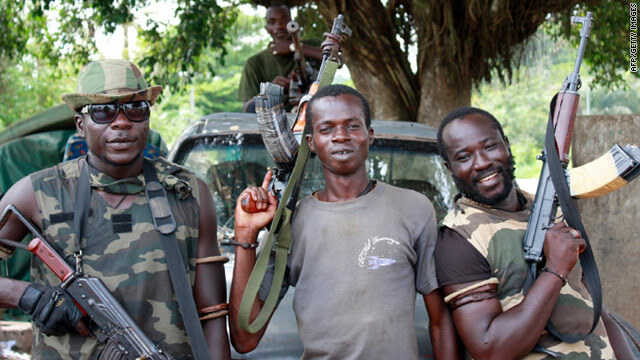 Pro-Ouattara forces are pictured with their weapons on Tuesday, March 29 in western Ivory Coast. (CNN) -- Forces loyal to Alassane Ouattara, the internationally recognized president of Ivory Coast, attacked the residence of disputed incumbent Laurent Gbagbo and took control of state-run TV early Friday morning, a spokesman for Ouattara told CNN. Gbagbo's residence is near the state-run television station taken over by Ouattara forces in the early morning hours Friday, said Patrick Achi, the Ouattara spokesman. Gbagbo apparently was not there. The takeover occured less than three hours after a Gbagbo spokesman appeared on the same network declaring that Gbagbo had no intention of leaving the presidential palace, according to a witness who saw the broadcast. The presidential palace is not Gbagbo's personal residence and is located elsewhere. Gbagbo has refused to cede power after a disputed November election. The takeover of the government network, which had previously been accused of inciting violence against protesters opposed to the Gbagbo government, came as Ivory Coast's internal war appeared to enter a decisive and final phase, with forces loyal to Ouattara making a final push to oust a defiant Gbagbo. Ouattara on Thursday declared a curfew in Abidjan as forces loyal to him moved closer to taking control of the city. The curfew, Ouattara said, will remain in effect until Sunday. Also Thursday, Ouattara's interior minister announced on radio that the air and sea borders of the country would be sealed until further notice. When will Ivory Coast crisis end? The curfew, however, did not seem to be universally recognized as Abidjan residents reported hearing sounds of heavy gunfire Thursday night. "It seemed there was a battle going on," said Diallo Ibrahim, adding that the "heavy gunfire" appeared to subside by midnight Thursday. Ibrahim, an accountant, said he watched the Gbagbo spokesman appear on TV and declared that Gbagbo would not leave the presidential palace. After the announcement, however, the station went dark, Ibrahim said. Ouattara's spokesman, Patrick Achi, told CNN earlier Thursday that rebel forces were patrolling some streets of Abidjan and were fast closing in on Gbagbo. It will be only "hours, maybe days" before Gbagbo falls, Achi said. "The army does not want to fight for Laurent Gbagbo." Residents in Abidjan told CNN that people were frightened at the prospect of an all-out war and were huddled in their homes Thursday. At sunset, they could still hear the sound of gunfire outside. Smoke could be seen in some parts of the city. "We can tell the fighting has gone to another level," said one resident who did not want to be named because of security reasons. "We are watching to see what will happen next." Humanitarian agencies warned Abidjan is on the brink of catastrophe. "The international community must take immediate steps to protect the civilian population," said Salvatore Sagues, Amnesty International's researcher on West Africa. Choi Young-jin, head of the United Nations' mission in Ivory Coast, said on France Info radio that U.N. peacekeepers have taken the place of army and police who abandoned Gbagbo on Thursday. Choi said that the siege laid on the Abidjan hotel where Ouattara was confined has been lifted. Ouattara was recognized as the winner of a November presidential election but had been holed up in the U.N.-protected Golf Hotel since then as the political stalemate led to escalating violence and turmoil. Meanwhile, Gbagbo's army chief, Gen. Philippe Mangou, asked for asylum at the residence of the South African ambassador, the South African government said Thursday. Achi said it was a sign that the armed forces now stand fully behind Ouattara. Republican Forces wrested control of much of the capital, Yamoussoukro, and other key cocoa-producing and port cities earlier in the week before marching to Abidjan, the commercial center of Ivory Coast. Ouattara issued a statement saying that despite numerous attempts to end the violence, Gbagbo had refused. He said Ivory Coast is now at a turning point in its history and called for unity. "In order to end the escalating violence in our country, the Republican Forces of Ivory Coast have started to put in place, in accordance with their missions, the protection of people and their property against the militia men and mercenaries paid by Laurent Gbagbo," Ouattara said. "They have decided to restore democracy and to respect the vote of the people," he said. "In every city where they went, they were greeted in jubilation." Human rights agencies have documented the deaths of 462 people -- some in heinous fashion -- and the displacement of more than 1 million from their homes. Many residents in Abidjan fear Gbagbo will not go down easily. Koffi Kouakou, a citizen of Ivory Coast who now lives in South Africa, said his family members were stocking up on food and waiting for the battle they feel is inevitable. "Everybody is calling it the battle of Abidjan," said Kouakou. "There will be a battle and people will be killed, unfortunately. Nobody knows when it is going to happen but it will happen soon." Concerned about the rising tide of violence, the U.N. Security Council voted unanimously Wednesday to impose sanctions on Gbagbo, his wife and three associates, as well as give U.N. peacekeepers more authority to protect civilians. The U.N. resolution demands that Gbagbo step down immediately and that all state institutions, including the military, accept Ouattara as president. It also authorizes U.N. peacekeepers "to use all necessary means to carry out its mandate to protect civilians under imminent threat of violence." The resolution imposes targeted sanctions and travel bans on Gbagbo, his wife, Simone, and three others: Desire Tagro, Pascal Affi N'Guessan and Alcide Djedje. The resolution accuses all five of "obstruction to the peace and reconciliation process" and of rejecting the legitimate election of Ouattara. All but Laurent Gbagbo are accused of "public incitement to hatred and violence." CNN's Christabelle Fombu, Moni Basu and Pierre Meilhan contributed to this report.